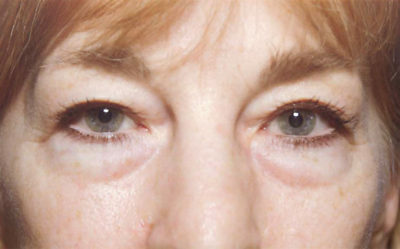 Both the upper and lower eyelids may become wrinkled and saggy. Some individuals are born with extra fat and skin in the eyelids while others have gradual fatty protrusions, wrinkles and excess skin. Pouches or bags of the upper and lower lids are generally due to herniations of fat normally located in the eye socket. Blepharoplasty surgery removes excess skin and fat in order to produce less puffiness around the eyes, less wrinkling, and bagging, and the appearance of more youthful and rested eyes. Blepharoplasty surgery may be performed in any age group from the twenties and thirties to the more senior aged patient. The procedure, performed on an outpatient basis under twilight anesthesia, is relatively painless. Very fine sutures are placed and no dressing is used. Most of the sutures dissolve on their own so that suture removal is avoided. The swelling and bruising usually subside by post-operative day seven. Makeup can be used in the interim for camouflage. Within several weeks to months, the surgical scars become imperceptible. We frequently recommend a light chemical peel or laser skin resurfacing for further tightening of the skin and improve fine wrinkles or crow’s feet. This again is done in the office with minimal discomfort. This requires about one week for the healing process to occur. Be aware that occasionally the upper lid bagginess is due to drooping of the forehead and brows. In these cases, it may be advisable to elevate and support these structures prior to or in conjunction with upper lid surgery. 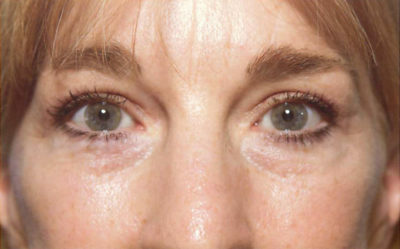 Eyelid surgery can be performed on upper and lower lids or both. It can also be performed in conjunction with facelift surgery, forehead lift or other cosmetic procedures. Please inform us of any eye related problems you have – or any previous eye surgeries. We also recommend you have an eye examination prior to eyelid surgery. We can help obtain an appointment if you were to have a problem doing so. Blepharoplasty surgery is considered cosmetic, and therefore not usually covered by insurance.